Chocolates Bocadin by Ricolino Bocadin Chocolates by Ricolino are wafers coated in delicious chocolate, these tasty treats are great for any event, party or just as a snack. Ingredients: Sugar, wheat flour, hydrogenated vegetable oil shortening (contains one or more of the following: palm oil, soybean oil, coconut oil), peanut, cocoa, carob flour, whey, malted extract, lecithin, vegetable oil, shortening (contains: one or more of the following: canola oil, cartamus oil, soybean oil, coconut oil), artificial flavors, antioxidant (BHT/BHA) salt and sodium bicarbonate. Chocolates Bocadin por Ricolino son galletas rellenas con una cobertura deliciosa de chocolate. 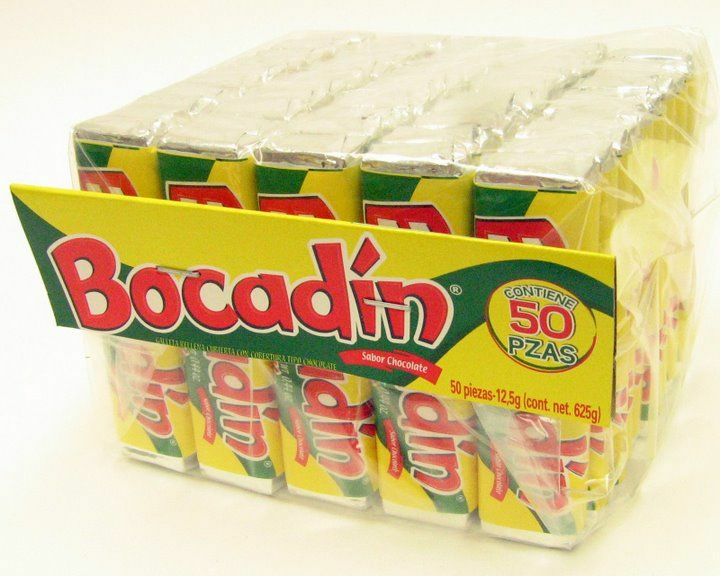 Estas ricas golosinas son perfectas para cualquier evento, fiesta o como botana. Ingredientes: az�car, harina de trigo, aceite vegetal hidrogenado, cacahuate, cocoa, harina de algarroba, suero de leche, extracto de malta, lecitina, aceite vegetal, saborizantes artificiales, antioxidante (BHT/BHA) sal yodatada y bicarbonato de sodio. I like that it is not overly sweet but it could use just a little more touch of sweetness and peanut flavor.